FLEX YOUR brain power like never before! From acclaimed author Dr. Gary Gruber, whose proven critical-thinking methods have sold more than seven million books, this collection of mind-bending brain teasers is sure to challenge even the most experienced problem solver. Inside are logic puzzles, riddles, maddening math problems, mental games, and more! A ship is twice as old as the ship’s boiler was when the ship was as old as the boiler is. The ratio of the boiler’s age now to the ship’s age now is what? What English word contains all the vowels, in alphabetical order? What is the three-digit number that can be made from the digits 2, 3, 5, and 7 where no two digits in the three-digit number are alike, and where the three-digit number is a multiple of each of the digits chosen? Stumped? Dr. Gruber reveals the fascinating explanations and detailed strategies for solving even the trickiest problems using his exclusive Gruber Method. 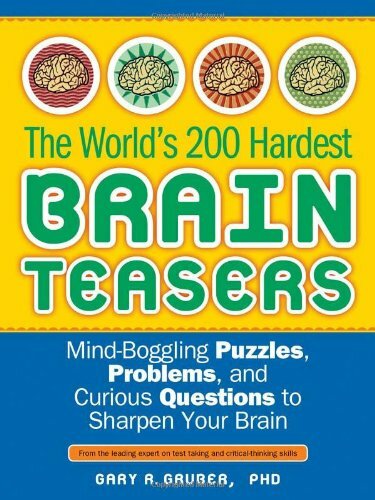 DISCLAIMER: The brain teasers in this book may get you so wrapped up in critical thinking that you may not be able to do your regular work until you solve them! Any abrupt or gradual increase in creativity, intelligence, or motivation to get a better job suited to your newfound talents is strictly the reader’s responsibility.